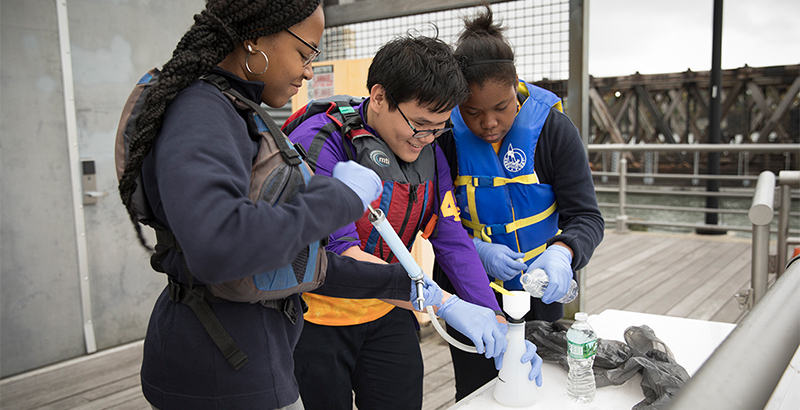 The citizen scientists of Bishop Loughlin Memorial High School stood in the rain, their testing kits at the ready to take samples of the Hudson River’s murky water off Manhattan’s Chelsea Pier. It was a Tuesday afternoon in the fall, and up until today, they had been practicing their technique in the confines of the lab. Their mission: to assist researchers from Cornell University by collecting environmental DNA from the river that they could then test for the presence of invasive species. And this is serious business, explains Donna Cassidy-Hanley, a senior research associate at Cornell Veterinary College. More than a dozen students from Bishop Loughlin’s STEM club participated in the effort with Cornell. The river samples are collected for FishTracker, a student-oriented citizen science project funded by the U.S. Department of Agriculture. The project is designed to detect and map the presence of invasive and endangered species in New York. Clad in puffy life jackets, ignoring the downpour, the students scooped water from the pier with a Poland Springs water bottle and recorded the GPS coordinates with their cellphones to identify surveyed sites. The eDNA samples collected by teachers and students are critical for monitoring the range of invasive and endangered fish species throughout New York state. So far, 270 different sites have been sampled by students from 73 schools across the state, including more than 10 in New York City. There are three ways to curb the invasive fish species problem, Cassidy-Hanley explained: prevent their introduction through education; control them through early detection and monitoring; and finally, eradication, which she believes to be virtually impossible. The students worked in teams of three: one student poured the water through a filter funnel, another student made sure everything is secure — that the pump did not detach from the funnel — while the third used a pump to vacuum out water and collect any eDNA present. They carried out each step with their control sample, a bottle of plain drinking water, then their sample from the river. Although they had practiced several times in class, collecting samples to send to Cornell’s lab for analysis with Cornell faculty present raised the stakes — and the sense of satisfaction. That feeling of being a player in a critical real-world problem is what the day was all about.